I have always been interested in lettering, as my primary school exercise books will confirm. My interest in calligraphy can be pinpointed to 1983 when I observed the remarkable ability of the broad edged pen to transform a friend’s handwriting. I embarked on a Showcard and Ticketwriting course in 1984 and enjoyed the calligraphy component immensely. I continued to learn and practice until 1988 when I was accepted into the Associate Diploma of Arts, Major in Calligraphy and Fine Lettering course at WACAE (now Edith Cowan University). This two year fulltime course, under the guidance of Peter Evans, taught me that a little knowledge is a dangerous thing! Ambitious, impatient and eagerly anticipating flourishes and elaborate illuminated capitals, we spent what seemed like forever on the fundamentals. There was much unlearning to be done! It took some time but I eventually came to love the economy of form and simple clarity of the foundational hand, and the value of many hours of pencil skeleton Roman! The course was enormously valuable to me and I have come to appreciate the benefits of patience, dedication and discipline which are the cornerstones of successful calligraphic practice. 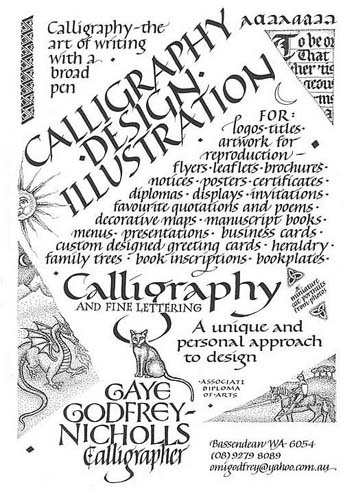 Since then I have attended many excellent workshops with internationally renowned calligraphers such as Ethna Gallacher, Denis Brown, Thomas Ingmire, Pat Russell, Margaret Daubney, Anne Hechle, Dave Wood, Diane Von Arx, Jean Larcher, Gemma Black and Gaynor Goffe. Since graduating in 1989, I have taught calligraphy to people of all ages from primary school to retirees. I have freelanced as a calligrapher with my own business since 1986. Edith Cowan University employed me in a part time capacity for six years as a calligrapher for corporate events.